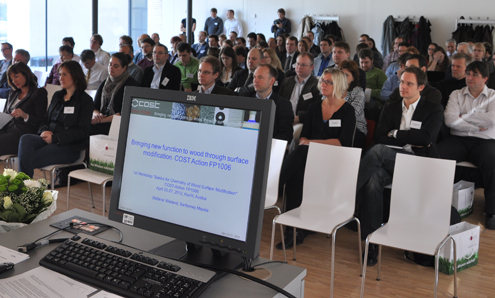 1st Workshop "Basics for Chemistry of Wood Surface Modification"
On behalf of the local organising committee and of the scientific committee of the COST Action FP1006 we want to make you aware of our upcoming Kick-Off Workshop “Basics for Chemistry of Wood Surface Modification” of the next COST meeting from 25-27 April 2012, Salzburg/Kuchl, Austria. This meeting, organized as an international workshop, will bring together experts from academia and industry but also young scientists from all around Europe and non European countries in the field of Surface Modification and Functionalization. The objectives of this workshop are to present and discuss the state of art and new findings of wood surface modification and functionalization processing and the challenges faced in wood characterisation and material interface interaction analysis as well as the estimation of the service life time. This COST Action will open the discussion of latest research results and new ideas. The advantage of combining renewable resources such as “wood” with a processing technique with low environmental impact to achieve a new high quality material is highly desirable. In case of the surface modification the properties of polymers are maintained and lower amounts of chemicals are needed for the functionalization process. However, there are many challenges associated with the surface modification process for improved, new or innovative wood surface properties, which require an interdisciplinary approach to be resolved. This means that a close collaboration between the wood mechanics and wood chemistry communities from both academia and industry is needed. The workshop will bring together experts and young scientists from worldwide academia and industry. It will encourage dissemination of the latest research works, exchanging and developing new ideas, and building collaborations between laboratories and research activities. The workshop will deal with various topics of wood surface modification and functionalization, material interface interactions and process and service life modelling as well as simulation techniques. Following the aim of COST to disseminate the results of the respective COST Actions to the general public, the following scientists have given their agreement to present their presentation. The presentations are presented according to the programme of the workshop with the name of the presenters.